Breakfast in Argentina is traditionally coffee and a pastry - café con leche y medialunas, anyone? - and after living and traveling abroad for almost a year (! ), a pile of bacon and eggs and various baked goods slathered in maple syrup is among the things I miss the most, not to mention the rejeuvenating effect of a bottomless cup of coffee. A recent article in Oh La Lá! magazine highlighted a few of the brunch options in Buenos Aires, and I started making dates to satisfy my Sunday-morning cravings. We started at Home Hotel, a boutique hotel in Palermo Hollywood where the huevos rancheros left us wanting more. I could easily have whiled away the afternoon sipping their very satisfying Bloody Marys poolside. 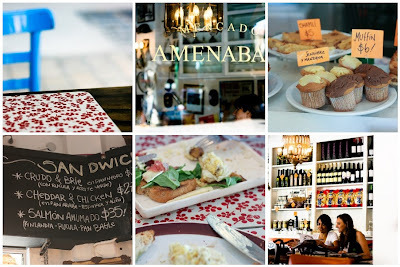 This past weekend marked a trip with a good friend to Mercado Amenabar, also in Palermo Hollywood. We shared scrambled eggs with toast and bacon, a proscuitto and Brie sandwich, and enough ideas and inspiration to last us at least until next Sunday's brunch date.